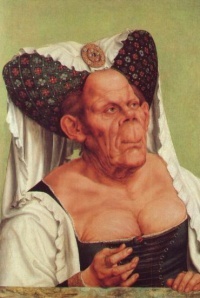 Quentin Matsys, his first name also recorded as Quinten or Kwinten and his last name as Massys, Metsys, or Matsijs (1466 - 1530), was a painter in the Flemish tradition and a founder of the Antwerp school, best-known for his painting The Ugly Duchess which served as a basis for John Tenniel's depiction of the Duchess in Alice's Adventures in Wonderland. He was born at Leuven, where he was trained as an ironsmith. Near the front of the Cathedral of Our Lady in Antwerp is a wrought-iron well, known as the "Matsys Well," which according to tradition was made by the painter-to-be. What characterizes Matsys in particular is a strong religious feeling, an inheritance from earlier schools. This feeling was permeated by a realism which often favored the grotesque. The faces of the boors of Steen or Ostade may well have had predecessors in the pictures of Matsys, though he was not inclined to use them in the same homely way. From the example of van der Weyden comes Matsys' firmness of outline, clear modelling and thorough finish of detail; from the van Eycks and Memling by way of Dirck Bouts, the glowing richness of transparent pigments. The date of his departure from Leuven is 1491, when he became a master in the guild of painters at Antwerp. His most celebrated picture was executed in 1508 for the joiners' company in the cathedral of his adopted city. Next in importance is the Marys of Scripture round the Virgin and Child, ordered for a chapel in the cathedral of Leuven. Both altarpieces are now in public museums, one at Antwerp and the other at Brussels. They display an earnestness in expression, a minuteness of rendering, and subdued effects of light or shade. Matsys, like the early Flemish painters, lavishes care on jewelry, edgings of garments, and ornament in general. Not much given to atmosphere, his paintings sometimes rely on the literalness of caricature: emphasizing the melancholy refinement of saints, the brutal gestures and grimaces of gaolers and executioners. Strenuous effort is devoted to the expression of individual character. A satirical tendency may be seen in the pictures of merchant bankers (Louvre and Windsor), revealing their greed and avarice. His other impulse, dwelling on the feelings of tenderness, may be noted in two replicas of the Virgin and Child at Berlin and Amsterdam, where the ecstatic kiss of the mother seems rather awkward. An expression of acute despair may be seen in a Lucretia in the museum at Vienna. The remarkable glow of the colour in these works, however, makes the Mannerist exaggerations palatable. But on the whole, the best pictures of Matsys are the quietest. His Virgin and Christ, Ecce Homo and Mater Dolorosa (London and Antwerp) display a serene and dignified mastery, gaining in delicacy and nuance in the works of his maturity. It is believed that he may have known the work of Leonardo da Vinci in the form of prints made and circulated among northern artists. Matsys had considerable skill as a portrait painter. His Ægidius (Peter Gilles) which drew from Thomas More a eulogy in Latin verse, is but one of many, to which one may add the portrait of Maximilian of Austria in the gallery of Amsterdam. In this branch of his practice, Matsys was greatly influenced by his contemporaries Lucas van Leyden and Jan Mabuse. In his rendering of polished detail, he may lack the subtle modelling of Holbein and Dürer. There is reason, however, to think him well acquainted with these German masters. He probably met Holbein more than once on his way to England. Dürer visited his house at Antwerp in 1520. Matsys also became the guardian of Joachim Patinir's children after the death of that painter, who is believed to have worked on some of the landscapes in Matsys' pictures. Matsys died at Antwerp in 1530. That rigor of religious feeling, which could be said to have slumbered in him, was eventually fatal to some of his relatives. His sister Catherine and her husband suffered at Leuven in 1543 for what was then the capital offence of reading the Bible: he being decapitated, she buried alive in the square before the cathedral. His works include A Portrait of an Elderly Man (1513), The Money Changer and His Wife (1514), and The Ugly Duchess (1515). The Ugly Duchess is perhaps the best-known of his works. It served as a basis for John Tenniel's depiction of the Duchess in Alice's Adventures in Wonderland. It is probably not a depiction of any one model, though it is sometimes said to be a portrait of Margaret, countess of Tyrol, also known as Margarete Maultasch ("Satchel-mouth"). Quentin's son, Jan Matsys, inherited the art but not the skill of his father. The earliest of his works, a St Jerome dated 1537, in the gallery of Vienna, as well as the latest, a Healing of Tobias of 1564, in the museum of Antwerp, are evidence of his tendency to substitute imitation for originality. Another son, Cornelis Matsys, was also a painter. The asteroid 9569 Quintenmatsijs was named in his honour. Unless indicated otherwise, the text in this article is either based on Wikipedia article "Quentin Matsys" or another language Wikipedia page thereof used under the terms of the GNU Free Documentation License; or on original research by Jahsonic and friends. See Art and Popular Culture's copyright notice. This page was last modified 17:09, 23 November 2014.